Ricin is a toxin contained in the seeds (beans) of the castor oil plant (Ricinus communis). The plant is found primarily in Asia and Africa but has taken root in all temperate and subtropical regions around the world and is widely grown as a garden ornamental. See the image below. Ricin is present in all parts of the plant but is most highly concentrated in the beans or seeds. The beans are covered by a hard, relatively impervious outer shell that must be chewed or broken in some way in order for the toxalbumin to be released and, thus, present a toxic hazard. In addition, castor beans are notably antigenic and may cause severe cutaneous hypersensitivity and systemic reactions. Although ricin is not the ideal biologic warfare agent, it remains a threat. It would not be the agent of choice for an aerosol attack but remains a major concern as a food and water contaminant. With the increasing number of biologic threats, hoaxes, and “how-to” Internet resources available, this threat has the potential to become reality. Therefore, it is essential for physicians to be familiar with the diagnosis and treatment of poisonings due to ricin. Exposure to ricin can result in toxicity or allergic reactions. Clinical manifestations of ricin toxicity depend on the route of exposure—that is, respiratory (inhaled aerosol), gastrointestinal (GI [ingested]), parenteral (injected), or dermal (absorption)—and on the delivered dose. For example, ingestion can produce delayed gastroenteritis, which may be severe and hemorrhagic. Other complications of ricin toxicity include severe multisystem organ damage; shock, disseminated intravascular coagulation (DIC), seizures, coma, and death. For patient education resources, see the First Aid and Injuries Center, as well as Biological Warfare, Ricin, and Personal Protective Equipment. For an agent to be considered capable of causing a maximum credible event, it should be highly lethal, inexpensively and easily producible in large quantities, stable in aerosol form, and readily dispersible (1-5 µm in size). The ideal agent also is communicable from person to person and has no treatment or vaccine. When these criteria are applied to ricin, the use of this agent as a WMD appears limited; nevertheless, the risk should not be underestimated. Indeed, ricin is produced easily and inexpensively; is highly toxic; can be disseminated as an aerosol, by injection, or as a food and water contaminant; is stable in aerosolized form, and has no treatment or approved vaccine. However, a considerably larger amount of ricin would be needed to produce the desired effect of a WMD than would be needed with a living replicating biologic agent or a chemical weapon. For example, the amount of ricin necessary to cover a 100-km2 area and cause 50% lethality, assuming an aerosol toxicity of 3 µg/kg and optimum dispersal conditions, is approximately 4 metric tons, whereas only 1 kg of Bacillus anthracis is required to yield the same effects. Ricin, however, would have efficacy as a disabling agent. Its use as a food and water contaminant easily could incapacitate many and overwhelm local healthcare resources. 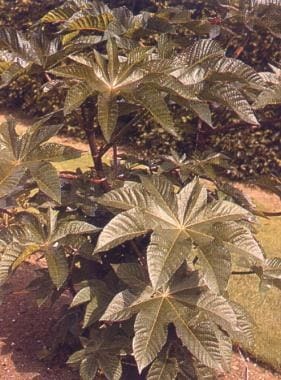 Castor bean ingestions are extremely uncommon. In 2015, the American Association of Poison Control Centers (AAPCC) recorded 180 cases of single exposures to toxalbumins (a class of toxic agents that includes both ricin and abrin, the toxin from jequirity beans). Of those patients, 72 were treated in a health care facility. Despite the fact that mastication of just one seed liberates enough ricin to kill a child, no deaths were reported, and only one case was considered to have a major adverse outcome. Gastrointestinal absorption of the toxin is poor,  which is probably the explanation for the favorable outcomes. Between 1991 and 1997, three criminal cases were related to ricin. In 1991 in Minnesota, four members of the Patriots Council, an extremist group that held antigovernment and antitax ideals and advocated the overthrow of the US government, were arrested for plotting to kill a US marshal with ricin. The ricin was produced in a home laboratory. They planned to mix the ricin with the solvent dimethyl sulfoxide (DMSO) and then smear it on the door handles of the marshal’s vehicle. The plan was discovered, and the four men were convicted. In 1995, a man entered Canada from Alaska on his way to North Carolina. Canadian custom officials stopped the man and found him in possession of several guns, $98,000, and a container of white powder, which was identified as ricin. Finally, in 1997, a man shot his stepson in the face. Investigators discovered a makeshift laboratory in his basement and found agents such as ricin and nicotine sulfate. In 1978 a Bulgarian dissident named Georgi Markov was assassinated on a street in London when a small pellet containing ricin was injected into his thigh. The highly publicized case of Markov illustrates the rapidly fatal nature of parenteral exposure. Markov, an exiled Bulgarian broadcaster, was waiting for a bus when he was jabbed with an umbrella in the lower extremity. He then developed severe gastroenteritis and high fevers and died 3 days later. Although studies are limited and accurate statistics are not known, the prognosis for patients who develop symptoms appears to be generally good with appropriate supportive care. Fatalities have occasionally been reported after ingestion of chewed castor beans. Chewing and swallowing as little as 1 bean may produce death in a child; however, swallowing an intact bean without chewing is unlikely to cause serious sequelae. Mortality and morbidity depend on the route and amount of exposure. Very little actual human data exist regarding the toxicity of specific dosages, but some information may be extracted from studies on nonhuman primates and mammals. For gastrointestinal (GI) exposure, the lethal dose for 50% of the exposed population (LD50) is 30 µg/kg in rodents. Ricin’s lethality is diminished when ingested. Castor bean ingestions were once considered fatal, but multiple case reports prove otherwise. Many documented cases are related to ingestions of multiple seeds and voluntary ingestion of ricin without fatality. If ingested in sufficient amounts, ricin can cause severe gastroenteritis, GI hemorrhage, and hepatic, splenic, and renal necrosis. Death may occur from circulatory collapse. For aerosol exposure, the LD50 for rodents is 3 µg/kg. Aerosol exposure causes weakness, fever, cough, and pulmonary edema within 18-24 hours and severe respiratory distress and death within 36-72 hours. In rodents, aerosol exposure is characterized by necrotizing airway lesions causing tracheitis, bronchitis, bronchiolitis, and interstitial pneumonia with perivascular and alveolar edema. Parenteral exposure can be rapidly fatal, with an LD50 similar to that of aerosol exposure. When injected, ricin can cause severe local necrosis of muscle and regional lymph nodes, along with organ involvement and death. Dermal exposure to ricin is of little concern, because the amount absorbed is insignificant. To be absorbed dermally, ricin must be enhanced with a strong solvent such as DMSO. Absorption would depend on the type of solvent and length of exposure, but for the most part, the dose of ricin from dermal exposure probably is too low to produce toxicity.